A while ago, while talking about tournament target weighting, I had a funny thought. What if we just count how many times a target appears in a source, and just use that? Simple. Objective. And people can’t quibble about where the numbers came from. And probably would produce something completely ridiculous and unhelpful. Because it’s fun. Considering point values this way is a pure thought experiment. Doing this for real would be a terrible way to structure a tournament. Tournaments are games. 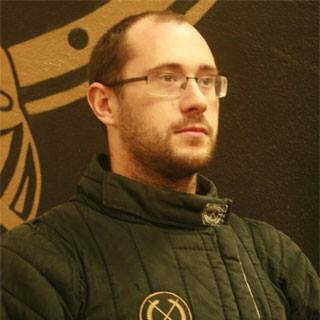 Games we create to (hopefully) help the competitors develop as martial artists. The role of weighting targets is to encourage competitors to behave in certain ways. Ways which help develop or showcase whatever skills the organizer feels is important. This means that weighting is a product of what the organizer wants people to do in a tournament; it encourages people to expand their repertoire beyond what they would do if all actions were considered equal. While we probably want to encourage things we see in the sources more often, a lot more goes into it than that. 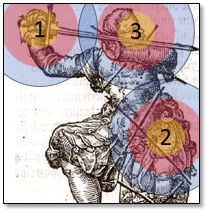 How frequently a target is mentioned is not a good indication of how often a technique is intended to be used. A bread-and-butter move that is used over, and over, and over again only had to be explained once. Whereas an author showing off might decide to include a dozen different techniques that would normally never be used. In counting how many times a target was mentioned I was aiming to go as quickly and exercise as little judgement as possible. There are many plays where we are instructed to “go to the other side” that I didn’t include because there was no clear target mentioned. If I wasn’t sure I went with my gut about whether to include the play or not. I expect that if someone else did this they would not come up with the identical number. And if I did it again I would almost certainly come up with a different count. Since this was mainly for fun*, I’m not stressed about it. *Seems like every stats article leads into me making a joke about how my definition of fun is strange for including number crunching. … oh wait. That’s just all cuts to the head. Since Meyer Longsword isn’t a very interesting discussion on the topic, let’s use the next best thing. 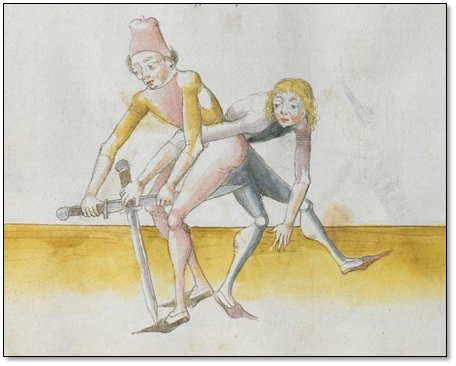 The first of what was going to be a common trend for German HEMA. A strong preference for targeting the head. The leg/hip is a little iffy, I was probably more biased towards leg because there were already so few there. That’s right, the thrust to the arm isn’t a scoring action! I told you at the start that this probably wasn’t the best method from which to base your rules. So while my hopes of Meyer longsword were dashed, there is still a weapon that I can get data from. I’m also going to call it sidesword from here on. Deal with it. Once again we see the strong head bias, though the lower openings were a little more represented. The big change is the mention of the thrust, completely swallowing the slice’s ‘market share’. I crunched these numbers on a cross-continental flight over a year ago, so the data isn’t as detailed (slices aren’t broken out). But I’m not going back to check. This looks a little bit more balanced, in fact if you scale the point values a bit it’s not that far off some rules I’ve seen in practice. So you could probably base a Meyer Sidesword tournament off this and not do too bad. … while we appreciate that it may negatively impact the implementation of certain historical devices, due to concerns raised by our insurance provider “Ripping Your Opponent’s Arms Off” is not longer considered a valid point scoring technique. 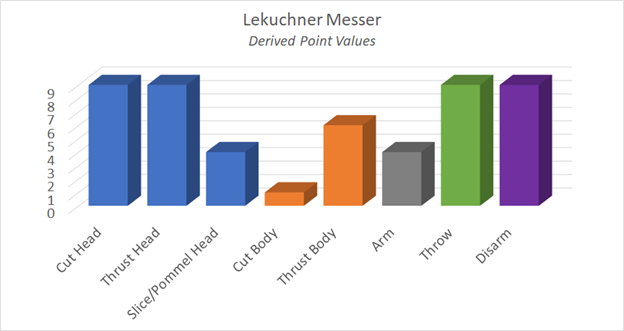 So on the German side it’s fairly conclusive that targeting the head is super important. 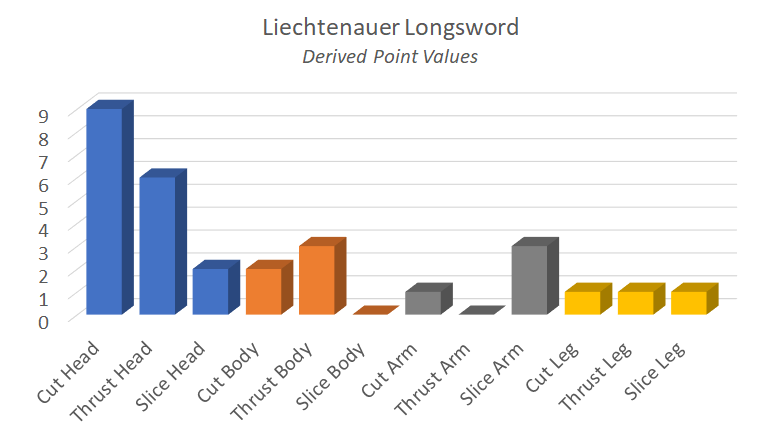 What about our other popular Longsword source? I decided to keep track of a few more things for this one. Mainly because, unlike the other two, I was collecting data for this article rather than staving off boredom on a long flight. The inclusion of so many slices may seem odd to you. It was certainly a surprise to me. As a matter of fact a large portion of them are grabbing your opponent’s sword and dragging it backwards across their face. 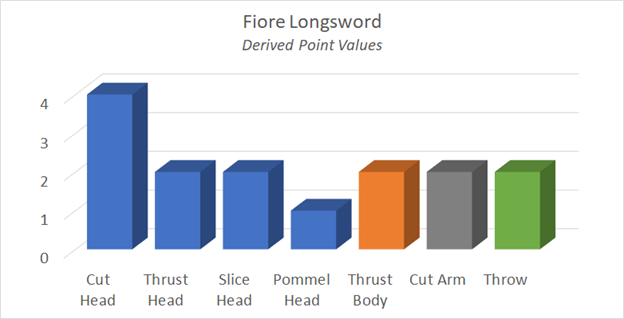 Since Fiore has so few longsword plays (in comparison many other sources) they actually affect the total significantly. And finally the fun one. 400 pages of wackiness. Wow. ¾ of all attacks going to the head. Looks like Fechtshule dussak wasn’t that far off the mark. In addition we see that the messer was very thrusty in comparison to cutty. Which is interesting, because most of the plays assume that the exchange started with the cut. And if we look at the close quarters techniques we see that they make up almost half of the plays (which shouldn’t surprise anyone who those who actually made the effort of reading to the end). And this doesn’t even include the fact that many cuts and thrust are described as being performed in at close distance. Knife fighting indeed!. To help you grasp how common each type of attack is, I’m going to show the raw data. And that’s quite the spread. 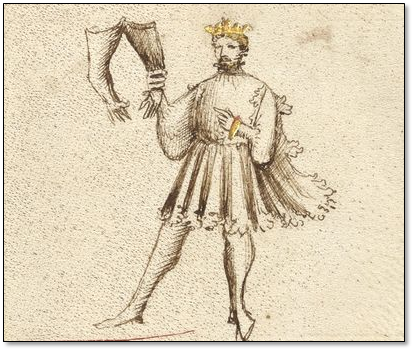 Yes, in this crazy tournament a thrust to the head is worth almost 100 times as much as a cut to the body! 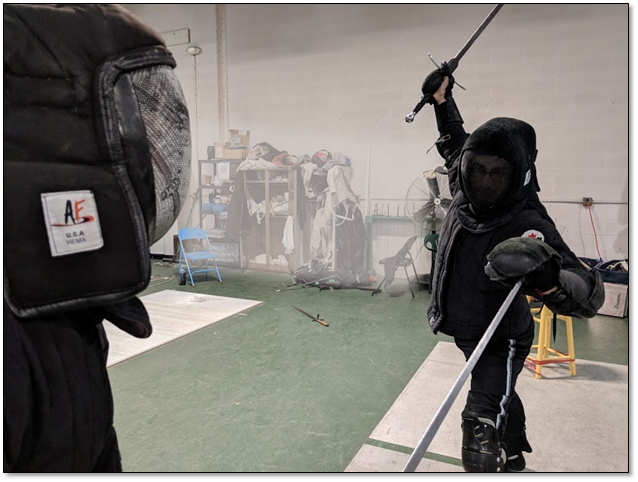 Having judge decide if the sword hit the neck or shoulder all of a sudden becomes reaaaaaaly important. Since even I don’t take this all that seriously I don’t know that you can draw too many conclusions from it. I suppose the main takeaway is that we are cutting to the torso waaaay more than we ever see described in sources, and not hitting the head near enough? And as always grappling is criminally under-represented. So basically things we already knew. 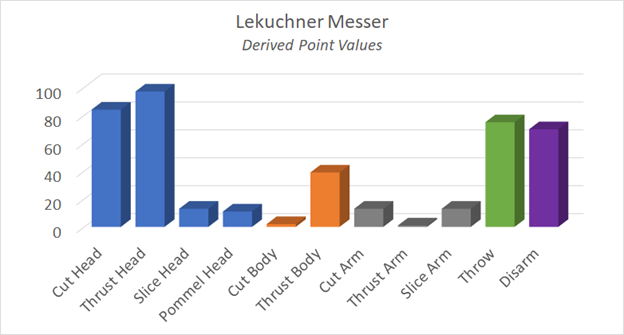 *I messed with the Lekuchner numbers a little bit. In the manual there are several plays which went into the generic “Arm Control” bin. This includes things like arm breaks, but also plays where you secure their arms and rotate/wrench to the side. Context-wise these will be either throws or disarms, but since it didn’t say explicitly I didn’t count them. Given how many I had at the end, I threw a third of them in as disarms and a third of them as throws. Some seriously robust methodology here.